Defrost your spinach according to the instructions on the packet and set aside. In a large nonstick frying pan, heat oil. Add the spices and cook over medium heat for one minute, stirring constantly. What are doing is “blooming” the spices by cooking them in the hot oil for a minute…this helps release all of the flavor that the spices have to offer! Add the chicken. Toss to coat and cook chicken for two to three minutes. Add spinach, jalapeno, and garlic to pan. Stir to combine. Cook 2-3 minutes then stir in chick peas and chili sauce. 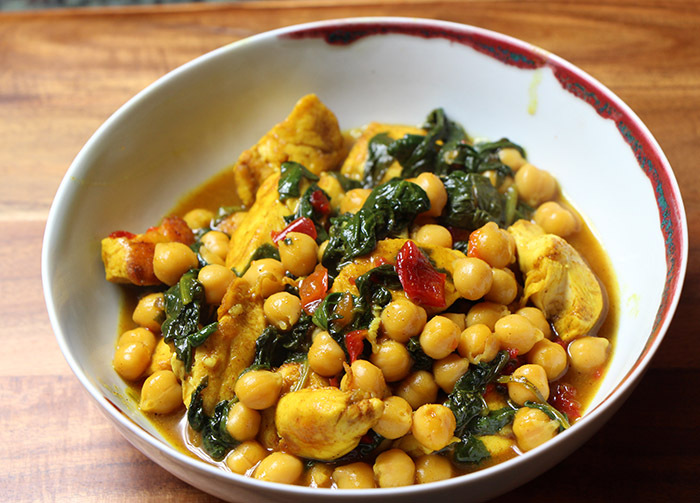 Reduce heat to low: simmer 2-3 minutes until chick peas are heated through and chicken is fully cooked. Can be served over rice (Jasmine or Basmati would be great choices here) if desired!